Erik graduated from Centralia College with an A.S. in Biological Sciences. He began volunteering at Wolf Haven almost straight out of high school, and was offered a full time animal care position after completing his Associates degree. 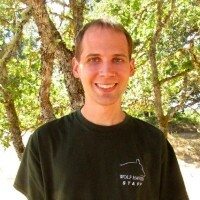 Erik has worked for Wolf Haven for ten years as an animal caretaker, and is recently filling in the position of Education Director. In addition to caring for the 50+ canids at Wolf Haven, Erik also assists in the captive handling of red wolves at various facilities and also serves on the Red Wolf Education Advisory Committee.